This week is Fashion Revolution week, a week that marks the 5 year anniversary of the devastating Rana Plaza factory collapse where 1138 people were killed. Fashion revolution is a movement made up of people working in the fashion industry- "we are the people who wear clothes. And we are the people who make them." The fashion revolution vision is this, "We believe in a fashion industry that values people, the environment, creativity and profit in equal measure". I have been thinking this week about where AMMA comes into it, and its taken me all week to come to a working conclusion. AMMA was started to be an example to the fashion and textile industry as an alternative way of production. To pay proper wages, provide a safe working environment and flexible working hours for mothers with young children. With our focus on developing natural dyes from food waste, plants and flowers, environment has always been central to our ethos. Along with this we are working really hard to make our supply chain traceable and as local to Sri Lanka as possible. Our most recent step being working with a cooperative of women weavers in the North of Sri Lanka to produce the raw fabric which we will then dye here in Nuwara Eliya. However, there is still so much we need to do, and as a social enterprise that has only been operating for 1 year, i know it'll take time to reach the standards we aim for. However, whilst thinking about AMMA in the context of the fashion industry and its impact I was reminded that currently 40% of the mothers we employ have worked in garment factories. In one case the factory was 5 hours from her home, and she was boarding aged 19/20. 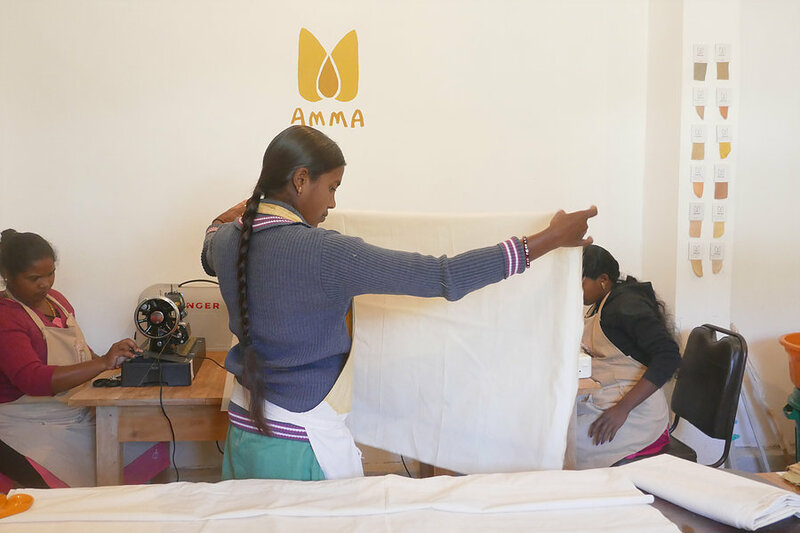 We get mothers from local garment factories asking for work, saying if a vacancy comes free at AMMA they will quit and come instantly. 40% of the mothers we employ have worked in garment factories. All this has surprised me, when starting AMMA I was expecting to employ women who had previously worked in the tea industry, although this is still true and all the mothers we employ live in estate accommodation it looks like for the younger generation, garment work is more appealing than tea work. This could be down to the higher starting wage, and the leech and snake free working conditions. However, the reality of garment work is tough with many women experiencing sexual harassment and having to live a long distance from their children and family. I recently spoke to a worker from a local garment factory who told me that the turnover of employees is really high, this is a factory that makes garments for M&S and Next. When the need for employment in the area is huge it makes me wonder why so many women leave so quickly after starting. 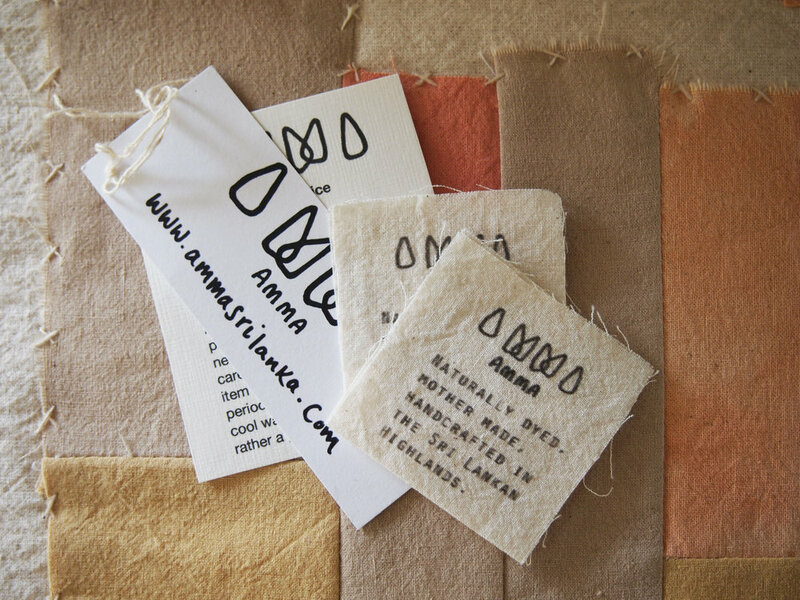 So to conclude i feel like it is important for small start ups like AMMA to speak out and support Fashion Revolution week, although our impact may be small, and not yet where we want to be, AMMA works directly with women 'who have made your clothes' and its only fair and just for their voices to be heard. So, i've been wrestling with where AMMA stands. Firstly; Like i mentioned above we still haven't met our desired ethical standards in regards to a transparent supply chain. Secondly; We don't make clothing and although we make small accessories with the majority of our income coming from orders, (which we are very grateful!) I see this more as work to get AMMA running sustainably, covering costs whilst we grow into a brand producing our own products. And ultimately i am very thankful and happy with this way of operating as we are paying wages and learning on the job which has bonded us as a team and has meant AMMA could launch with minimal financial backing.